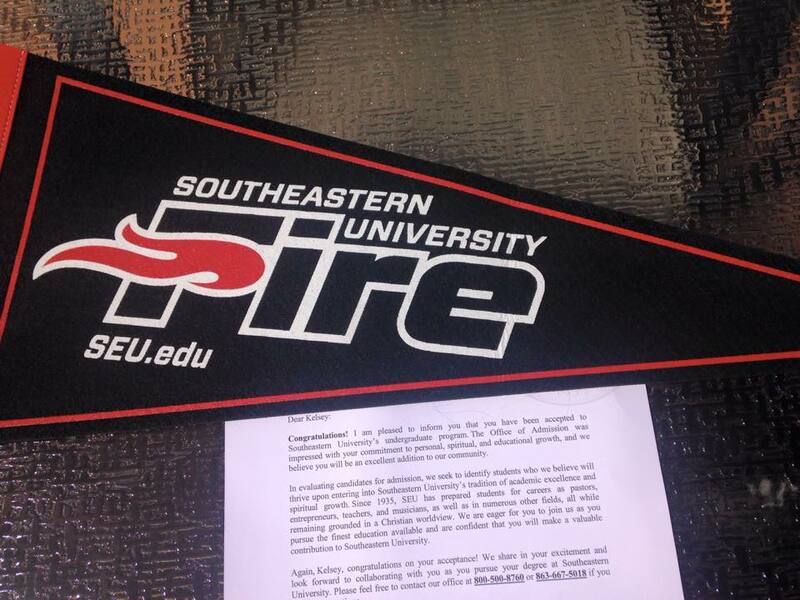 My oldest daughter, Kelsey, received her acceptance letter in the mail recently from Southeastern University in Lakeland, Florida. She sent me a text with the photo (shown to the left) of the letter with a pendent included, and, well, I paused for a moment to reflect on this good news as tears welled up in my eyes. Ask anybody that knows me very well and they’ll tell you that I don’t cry… ever (well, I did cry one time when my favorite team lost in the final seconds of the big game, but that’s a another story for another day). But when I received Kelsey’s text that day with this exciting news… I cried. Yep, I admit it. I sat down in my chair behind my desk, and in that solitary moment of emotional reflection… a few crocodile tears welled up in my eyes as I tried to deal with the emotion that my baby girl was “officially” growing up. I guess you could say my tears were a mixture of joy, sprinkled with a dash of pride, all colliding with the reality that my little princess would no longer be sleeping in her bed, under our roof, eating at our table, commandeering “my TV remote”… well you get the idea. Yep, it’s the stark reality that her mother and I now have to come to terms with that our oldest daughter is no longer our cute little princess, sitting on our laps, asking question after question, many times not even pausing long enough for us to answer, barreling down the highway of discovery. She is now a growing, beautiful young lady, full of passion, vision, dreams, creative ideas and plans for her life and… who also loves Jesus with all of her heart. By any definition, I would say that’s what true success looks like! What a treasure. What an accomplishment. What a gift. What a success in life! If you are a parent who’s reading this post right now, I want to encourage you by saying, you are not defined as a successful parent based on how much money you make, how big your house is, how many cars you own or how many big screen TVs you have hanging on your walls. You are deemed successful as a parent when you lead your child into a growing relationship with Jesus! And once you have both taught and modeled what it means to be a growing follower of Jesus, you can send your children off into the big, scary, dark world without fear, knowing that you have dedicated them to the Lord; that His hand is upon them; and that the Holy Spirit is the best guardian you could ever ask for. So, we are challenged, as parents, to supply our children with the basic faith essentials of helping them to find their roots in Jesus as their lives are being built on him, the very foundation of our faith. True success in parenting is not measured so much by how our kids behave as by who they are becoming under our watchful care! So, let’s lead them wisely… and then stand back and watch who they become and what they will accomplish for God’s glory! Oh, by the way, grab some Kleenex… you’re gonna need it!